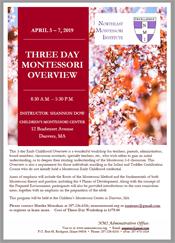 The Northeast Montessori Institute (NMI) Early Childhood course of study at the Woodland Hill Montessori School is an additional location for Northeast Montessori Institute and prepares teacher candidates to conduct Montessori classes for children between the ages of two and one half through six. The Northeast Montessori Institute-Woodland Hill is an applicant in good standing with the Montessori Accreditation Council for Teacher Education. The Northeast Montessori Institute (NMI) offers a year-round training format designed to offer enrolled adult learners a reasonable and manageable training schedule, providing year-round courses and support. The program provides both enrolled adult learners and their internship schools with greater training course assistance through adult learner-instructor interactions during the summer weeks, as well as throughout the internship year during the weekend seminars. This approach provides the adult learner with ongoing training program instruction at a slower pace, together with more continual input from the training program to the internship schools. The schedule is designed to try to meet the personal time restraints of individuals who will be leaving their home situations in order to participate in the certification course, and can be completed in twelve months. The program begins with three weeks of summer training, followed by six weekend seminars during the year. This schedule is designed to provide both support and greater academic quality, since instruction will be given in shorter, more frequent sessions. Successful completion of the program leads to recommendation for the American Montessori Society (AMS) Early Childhood Credential, or, for those individuals not holding a Bachelor degree or higher the AMS Associate Early Childhood Credential. The career opportunities for an individual with a Montessori credential are numerous and diverse. The Northeast Montessori Institute office serves as an informal clearinghouse for job opportunities. While the Institute can assist in connecting adult learners to possible employers, state requirements and school situations vary so widely that employment, salary, and occupational advancement are not guaranteed by the Institute. The 2018-2019 Early Childhood Course of Study will begin on Monday, July 9, 2018 and will be completed in June 2019. The program consists of a three-week summer course phase, together with six weekend seminars scheduled throughout the year and a nine-month student teaching experience (practicum). Enrolled adult learners can sign up to complete the course of study as described or can design their course schedule differently with the approval of the program director to better meet their needs. Enrolled adult learners can also choose to complete all their course work before entering the internship phase. Adult Leaners will also participate in an on-line Child Development course through Xavier University and also have the option of participating in a Masters degree program through Gordon College. The summer course phase will be held at the Woodland Hill Montessori School in North Greenbush, New York and involves three weeks (M – F) of academic instruction scheduled from Monday, July 9th through Friday, July 27th, 2018. Classes will be held between 8:30 a.m. and 5:30 p.m. each weekday. During this summer phase of the program, adult learners will be introduced to the following courses: Montessori Philosophy; the Everyday Living (Practical Life) Curriculum, including Cooking and Nutrition; the Sensorial Curriculum, Observation, and introductory hours in the Language Curriculum and Math Curricula. During the summer phase, adult learners will also participate in student teaching seminars, which will help to prepare them for the Practicum Phase of the program. It is our goal to prepare enrolled adult learners as thoroughly as possible for the nine months of student teaching so that each enrolled adult learner experiences the best possible benefits from their practicum experience. There will be six (6) two- or three-day seminars throughout the year as follows: October 6th – 8th, November 16th– 18th, 2018; and January 19th – 21st, March 9th & 10th, April 12th – 14th, and May 18th & 19th, 2019. The seminars offer individuals the opportunity to meet with instructors and to receive continued feedback on their progress in the program, while providing for the continuation of instructional courses. The adult learners will continue their course studies with Child Development and the Montessori curriculum areas of Math, Language, Science, History, Geography, Art, Music and Movement, Classroom Leadership, Parent Involvement, and Peace Education. The weekend seminars will either involve two or three days as indicated below and will be held on the Woodland Hill Montessori School. * Though unusual, academic course dates are subject to unanticipated change. The American Montessori Society and Northeast Montessori Institute require each Montessori teacher candidate to complete a nine-month teaching practicum in a 2.5 – 6 Early Childhood classroom. To meet the student teaching requirement for teacher certification, the adult learner must teach in a Montessori classroom for at least a half-day session for a period of nine months. The AMS requirement of the practicum being a minimum of 540 hours is based on a 180 day school year comprised of 3 hours per day. Additional hours outside of scheduled class time may be needed for the intern to participate in such activities as material and/or classroom preparation, record keeping, planning meetings, conferencing, etc. The Early Childhood practicum is defined as lasting a minimum of a full academic year, with the adult learner working at the practicum site, in the classroom of an approved supervising teacher for a half-day session, five days a week for nine-consecutive months. During this practicum, a field supervisor contracted by the Institute will visit the student teacher three times during the internship year. All requirements for the supervised practicum also apply to the self-directed practicum, with the exception that the adult learner has full responsibility for the Montessori class without the guidance of a qualified supervising teacher within the classroom. A minimum of three on-site consultation/evaluation visits by a qualified field consultant plus additional support that is documented on the AMS Credential Recommendation form is required. Additional support might include extra visits, a local mentor teacher, monthly phone or email contact, or other support designed by the director. Additional fees may be assigned due to the increased cost involved in providing added support to the adult learner selecting the self-directed practicum. An additional fee of four hundred fifty dollars ($450.00), payable to the Institute, shall be due at the beginning of the practicum phase should the adult learner wish to arrange for three additional visits through the Institute. Other forms of support arranged through the Institute will be negotiated on an individual basis based on the nature of support provided. Any associated costs incurred in arranging for support independently shall be the responsibility of the adult learner and is subject to approval and review by the Program Director. Wherever possible, we do recommend the Supervised Student Teaching Practicum model, since we feel that the adult learner can benefit from the daily support of a Montessori teacher. In situations where the Supervised Student Teaching Practicum model is not available, the Institute will work with the school and intern to provide the best possible self-directed student teaching experience. In most cases, student teachers are paid a salary or a stipend by the practicum school site. All such arrangements are made between the intern and the school and no assurances can be made by the Institute. The Institute will provide assistance in locating possible internship sites if requested. Note: Individuals who select a practicum site located more than 150 miles from the selected training site will be charged an additional fee to cover reasonable transportation expenses associated with on-site visits. 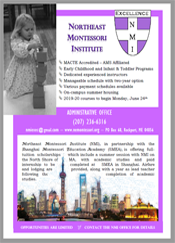 The Northeast Montessori Institute conducts the Early Childhood course at the Woodland Hill Montessori School (WHMS). Originally founded in 1965 by a group of dedicated parents, The Montessori School of Albany (MSA) officially changed its name to the Woodland Hill Montessori School in 2002, following its move to a new facility in North Greenbush, NY. For over half a century, originally as MSA and now as WHMS, this dedicated group of parents and educators has continued to grow and prosper, now providing Montessori programs from Toddler through Middle School. Nestled on a beautiful eleven-acre campus in the hills of North Greenbush, the Woodland Hill campus overlooks the Hudson Valley and with the city of Albany in the distance, provides a truly inspiring learning environment. WHMS is fully accredited by the American Montessori Society and was accredited by the National Association of Independent Schools in 2003. Fewer than 50 of the thousands of Montessori schools in North America have received this recognition. Woodland Hill is also fully accredited by the Middle States Association of Colleges and Schools. Tuition payment plans are available through NMI. This information is available following submission of application and can be found on the NMI website under FEES, or by contacting the Institute. A service charge of $5 per payment will be added to payment plans. An initial deposit of $1,400.00 is due by June 1st, 2018. All adult learner fees and intellectual property fees will be deducted from this initial payment and are non-refundable. A service charge of $5 per payment will be added to payment plans. Tuition policy information and an overview of payment plan options are available by clicking here. These fees cover the adult Learner’s intern membership in the American Montessori Society (AMS) and pay the Montessori Accreditation Council for Teacher Education (MACTE) dues. These fees also cover materials provided by individual instructors, together with required textbooks and curriculum materials provided through the Institute. These fees are non-refundable. Those participating in the Early Childhood program should plan to budget additional funds to cover incidental costs such as transportation, meals and lodging. In addition, curriculum materials will need to be printed and organized into albums (3-ring binders) prior to submission for final review. This consists of five curriculum albums (Practical Life, Sensorial, Language, Math, Culture) due at seminars throughout the academic phase. Specific guidelines for organizing curriculum and reference materials will be provided by individual instructors throughout the course of study. The American Montessori Society offers partial scholarships. Applications are available by request through NMI, following receipt of program application, or can be found on the AMS website. AMS scholarship applications require the signature of the program director prior to submission. Adult Learners who choose to intern in a Montessori school in Massachusetts are also eligible to apply for scholarship through the Montessori Schools of Massachusetts (MSM). Scholarship application deadlines for the above are May 1st and March 15th, respectively. Scholarship monies awarded are applicable for tuition costs only. Additional information is available on the AMS and MSM websites. It is the belief of Northeast Montessori Institute that individuals wishing to undertake Montessori teacher training not be prevented from doing so due to financial restrictions. Northeast Montessori Institute is not, however, a lending institution and encourages applicants to seek alternate financing when available, as the meeting of its operating costs and salaries are based upon the responsible timely tuition payment of its Adult Learners. All associated expenses incurred by undertaking this course of study remain the ultimate responsibility of the participant regardless of third-party sponsorship. Admission to Northeast Montessori Institute will not be denied based on age, race, gender, religion, national origin, disability, or sexual orientation.